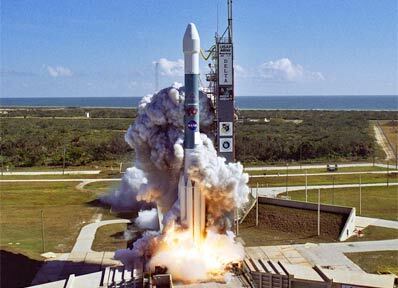 CAPE CANAVERAL, Fla. - Look out Comet Tempel 1, here comes Deep Impact! A washing machine-sized projectile tucked inside its mothership spacecraft launched from Earth today on a 268-million-mile collision course that promises to create spectacular July Fourth fireworks when the 820-pound copper-tipped bullet smashes into the comet's frigid heart. Comets are wandering cosmic time capsules preserving 4.5-billion-year-old primordial material that holds the chemical records of the solar system's creation. Deep Impact's violent rendezvous with Tempel 1 is designed to burst through the crust coating the comet's nucleus, form a stadium-sized crater and offer an unprecedented glimpse at ancient ices packed beneath the surface. "What we see coming out of comets as gas and dust is stuff that has been modified because it is very near the surface, and every time the comet goes around the sun the surface gets heated. So there have been changes in the surface layers... What I really want to do is figure out how different the surface is from what's inside," said Michael A'Hearn, astronomer from the University of Maryland and the Deep Impact principal investigator. The pristine building blocks buried inside these rocky snowballs will tell astronomers what conditions were like when the solar system was spawning planets. Uncovering the compositional fingerprints of comets has become a priority for scientists because these objects peppered the young Earth, possibly delivering the organic materials needed for the rise of life, the water for our oceans and even playing a role in generating the atmosphere. "Deep Impact is a bold, innovative and exciting mission which will attempt something never done before to try to uncover clues about our own origins," said Andy Dantzler, acting director of the Solar System Division at NASA Headquarters. "Why understand comets? Why study comets at all? Comets are the most primitive bodies in our solar system and they are made up of the very material from which all of the planets and the sun, in fact, are made." Past spacecraft have flown close to comets, but Deep Impact will be the first to reach and out touch one. "We're really excited about this mission," said Rick Grammier, Deep Impact project manager at the Jet Propulsion Laboratory in Pasadena, Calif. "We're doing something that's never been done before, we're actually going to go smash a big piece of copper into a comet nucleus and see what happens and see what's inside." About 24 hours before arriving at the comet, the explosive bolts holding the projectile within the Deep Impact mothership will detonate and the impactor spring-ejects for its cruise to collision. Both craft were built by Ball Aerospace. The impactor, a stubby-nosed bullet about two-and-a-half feet tall and three feet in diameter, sports a manhole cover-sized disc of copper with even more copper mass behind it to penetrate as deep into the comet as possible. A quarter of the impactor's launch weight is copper. "We don't know what comets are made of, we don't know how strong they are. They could be weak and fluffy like a bowl of corn flakes, it could be like a concrete sidewalk that we are hitting. Part of the challenge in the design of the impactor was to take into account either possibility," Jay Melosh, Deep Impact co-investigator. Deep Impact began its voyage atop a Boeing Delta 2 rocket, blasting off at 1:47:08 p.m. EST (1847:08 GMT) from pad 17B at Cape Canaveral Air Force Station, Florida. The three-stage booster took an eastward heading, achieving an initial parking orbit around Earth less than 10 minutes after launch. Another engine firing nudged the rocket higher, and then the solid-fueled third stage motor propelled the spacecraft out of Earth orbit to cap the 34-minute launch sequence. 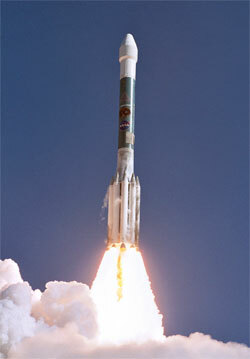 "We had a perfect launch," NASA launch manager Omar Baez said. 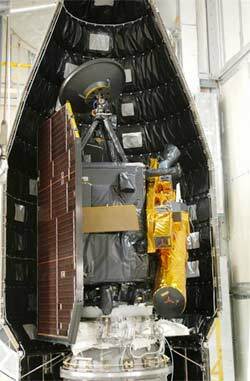 But an overly conservative setting for a temperature gauge put the Deep Impact spacecraft into a protective safe-mode soon after separating from the Delta rocket. The parameter can be adjusted and engineers were optimistic Deep Impact would return to normal operating conditions within the next 24 hours. Today Comet Tempel 1 is about 160 million miles away in the asteroid belt on the inbound route of its orbit around the sun. It remains in a quiet state but that won't last much longer. "The comet will be active when we encounter it. It'll be as close to the sun as it ever gets, it will be boiling gas and dust off and we have to go through that before we can strike the comet," Melosh said. Starting two months before the encounter, Deep Impact commences its science observations in earnest, painting a picture of what the spacecraft should expect at arrival and giving ample time to change the approach strategy if necessary. Specifically, mission planners want to pin down how the comet nucleus rotates and examine the jets of gas and dust streaming away from Tempel 1. Discovered on April 3, 1867 by Ernst Wilhelm Leberecht Tempel in Marseilles, France, Comet 9P/Tempel 1 currently circles the sun every 5.5 years. Its orbit lies between Mars and Jupiter, providing the Deep Impact mission a perfect target for reaching with a modest launch vehicle, striking at high speed and being visible from Earth at impact. The exact size and shape of the comet's nucleus is unclear from observations made to date. It is thought to be elongated and 3.7 miles in diameter. 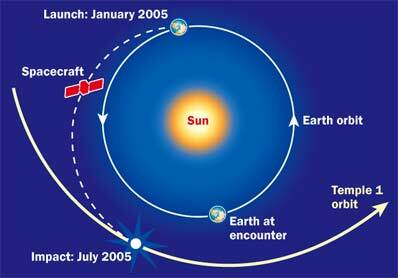 How Tempel 1 will react to the impact is also a mystery, but scientists do not believe the comet will shatter apart. "It has turned out that the physics of how the impact occurs is also a large unknown because we know so little about fragility or strength of the cometary nuclei generally. We certainly know nothing about this particular comet," A'Hearn said. "There is an outside chance that we could break the comet. We don't think that will happen... We don't think that the comet can propagate a shockwave through from one side to the other so that you can break it because we don't think it's that strong and cohesive everywhere." The impactor is equipped with an autonomous navigation computer, cameras and a propulsion system to guide itself toward a suitable impact point that is well lit. After releasing the impactor, the mothership performs an evasive maneuver, plotting a trajectory to fly past the comet shortly after the impact. "Early images from the impactor are mainly for navigation... to make sure that it hits in an illuminated area and not in a dark area. As we get closer, those images become important for science because as we get closer and closer we will get higher and higher spatial resolution. We will directly see the change in texture as you change spatial scale. Assuming the camera on the impactor survives until very shortly before impact, these will be the highest resolution pictures ever of a cometary nucleus, much higher than we will get from the flyby [spacecraft]," A'Hearn said. Sophisticated instruments on the mothership will record the blast and peer into a crater that is formed. 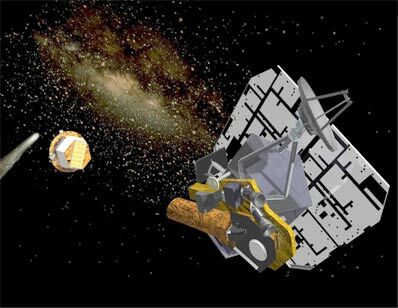 Meanwhile, observatories around the globe, plus the Hubble, Chandra and Spitzer space telescopes, will be watching the aftermath to collect crucial information about the dusts and gases blown out of Tempel 1. Sky watchers in the western U.S., Hawaii, New Zealand, eastern Australia and the South Pacific could be able to see the impact, which happens 83 million miles away from Earth around 2 a.m. EST (0600 GMT) July 4. "We expect to provide some great fireworks for all our observatories," said Karen Meech, Deep Impact co-Investigator at the Institute for Astronomy in Hilo, Hawaii "That's exciting, to do it on July Fourth." The flyby craft will be using its spectrometer to identify and quantify the materials across the comet's dust- and gas-filled coma head and taking images in a wide variety of different colors. Since the nucleus is believed to have a 41-hour rotational period, less than half will be seen at good resolution. "Shortly before the time of impact, the flyby spacecraft determines how fast it is having to rotate to keep the high-resolution camera pointed at the nucleus. It uses that to calculate when it will be at closest approach and then knowing the difference velocity, when the impactor will impact. It sends that information up to the impactor so the impactor can optimize the imaging sequence at the expected time of impact. Flyby uses it internally, also, to optimize the imaging sequence for the time of closest approach," A'Hearn said. Information from both craft is fed back to Earth in real-time in case comet shrapnel fatally wounds the mothership during the encounter. 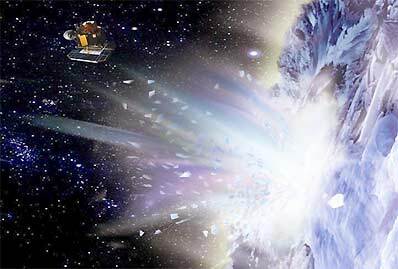 An artist's concept shows the Deep Impact impactor as it reaches Comet Tempel 1. Credit: Ball Aerospace & Technologies Corp. The impactor and comet collide at 23,000 mph, releasing the energy equivalent of 4.5 tons of exploding TNT. "We put the impactor in the comet's path so that the comet overtakes it. So it is like standing in the middle of the road with semi truck bearing down on you," Grammier said. The intense forces vaporize the projectile as the circular crater -- perhaps 300 feet in diameter and 100 feet deep -- is rapidly excavated. "We expect it could put a crater about the size of a house up to the size of a football stadium and it could be anywhere from seven to 14 stories deep. 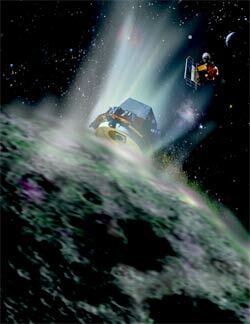 "As a result of forming the crater, it will throw out a bunch of the surface and interior material that is displaced. It will come up in a big cloud that will reflect the sunlight. So you will see a large brightening, and you will see that brightening from telescopes on Earth as well. Then you will see it slowly dissipate as the material either settles back down onto the comet itself or becomes part of its coma dust cloud. What we are hoping to see to from the flyby spacecraft viewpoint is being able to look all the way down into the interior of the crater and determine what its materials are made of," Grammier continued. "Since these are the original remnants of the solar system formation, not knowing how the exterior of a comet relates to interior, what we are hoping to do is expose all of that fresh material and see the material that was actually present at the formation of the solar system." "By understanding and watching how this crater develops, and then fine-tuning our computer models to reproduce what is actually observed, we can determine how the comet is put together," added Don Yeomans, Deep Impact project scientist from the Jet Propulsion Lab. The impact occurs with the mothership 5,400 miles away and closing fast. The medium-resolution camera will be taking pictures as swiftly as possible to capture the moment of impact. "We are hoping to catch a bright flash that will last less than a second by taking four or eight frames per second," A'Hearn said. The high-resolution camera snaps pictures at a slower pace. Scientists expect the materials thrown out of the freshly bored hole will settle within a few minutes, permitting good visibility into the crater. The mothership has less than 14 minutes to make its observations while zooming toward the comet before passing by Tempel 1 at a distance of 300 miles. The craft enters a "shield mode" to protect itself from the powerful sandblasting during flight through the coma at closest approach. "Our baseline is it will take 200 seconds to form the crater, but uncertainties in the density of the nucleus - something that we just don't know - the crater could take as long as 600 seconds to form. This was one of our mission design problems, making sure we had long enough interval to observe so that we make sure the crater finished forming before we flew by but keeping the interval small enough that we weren't so far away at the time of impact that we had no resolution. This what led us to the 800-second window between impact and the going into our shield mode through the innermost coma," A'Hearn said. "The biggest uncertainty in the mission is what the phenomena will be at the time of impact. And that is because there are many different ideas in the scientific community about the nature of the cometary nucleus. "There are some people in the community who think the nuclei are strong and that we will have an ejecta cone that leaves the nucleus entirely. We think the cone will stay attached to the nucleus and the crater will be controlled by gravity. "Other people think we will fracture the nucleus into several pieces, other people think we may just compress material downward and not eject anything outward, or almost nothing outward," A'Hearn said. "It is this uncertainty in the predictions, or the wide range of predictions, that makes it particularly important to do this conceptually very simple experiment." Deep Impact has just one shot at grabbing scientific data on the primordial material packed inside the comet. "We do maps across the nucleus after the impact to try and get spectra of the crater floor, see how different it is from the neighboring terrain that is undisturbed," A'Hearn said. "We take some spectra off the limb to look at the gases that are coming out of the crater. As we get very close, we actually have to let the camera drift a little and take a couple of images to make sure we get crater in the high-resolution camera." What might the craft see down in the crater? "My guess is if we excavate more deeply, we will see more carbon dioxide and carbon monoxide, dry ice vaporizing instead of water ice vaporizing," A'Hearn said. "The more volatile ices have been depleted in the surface layers. That's the kind of signature that we're looking for, to see how that composition changes." About 50 seconds before closest approach, the flyby craft orients itself with protective shielding guarding against a destructive hit by comet dust. "We've designed extra shielding on certain parts of the spacecraft. So when I say it turns to shield mode, what that means is it actually places those shields in the direction of the cometary dust and debris. 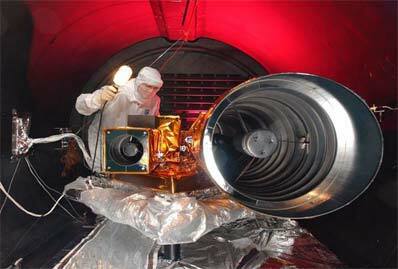 That is meant to protect the spacecraft itself from any particle hits. That shielding was designed based on what we know today of probable particle sizes, distribution and density at that distance from the comet," Grammier said. Despite the added protection, the mothership will be relaying its pictures and information to Earth live in case the craft doesn't survive the encounter to tell the tale afterward. "There are worries, that is why we are transmitting as much as we can in real-time, as much as the communications system will allow us to," A'Hearn said. "The engineers have predicted that the probability of a fatal hit is down at the one or a couple percent level, given the amount of shielding we have." Once through the dangerous region, the departing mothership maneuvers to observe the comet's back side a quarter-hour after closest approach. "We fly through the innermost coma, fly through the orbital plane and then turn around and look back... to take images of the other side. When we take pictures of the other side, the crater itself will be hidden, but we will still be looking to see if we can see ejecta from the crater. A likely scenario is that after we make the crater, there will be a lot spontaneous outgasing from the floor of the crater because there is very volatile ice near the surface that used to be buried deeply. There is a reasonable chance that we would see a new jet in the coma coming from the crater - and we would see it where it comes out from behind the limb of the nucleus," A'Hearn said. "We also use these look-back images to figure out the three-dimensional shape of the nucleus since we don't get to see a full rotation. We do the look-back monitoring for up to a day after impact." Ground-based telescopes in Hawaii will have prime viewing with the comet high in the sky at the time of impact, while the southwestern U.S. and Baja California will have Tempel 1 low in the sky. 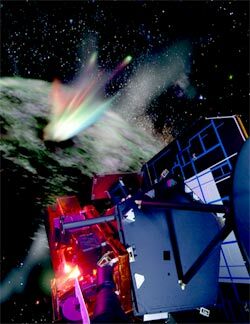 But a global campaign is underway to provide thorough monitoring of the comet before and after the collision with special imaging techniques. "We may create this new jet that may persist for hours or days or weeks or even months. So we are looking for observations afterwards," A'Hearn said. "We are trying to get complete longitude coverage so we can monitor the comet continuously from something like four days before the impact - two rotation periods - until a week after the impact." "At the time of encounter, we may be able to see a bright flash of light momentarily," Meech said. "But the main part that we're going to be looking for from the ground will be some of the long-term effects. For example, as the dust from this newly excavated crater starts to flow away from the comet, it will take many days to spread...and form a nice dust tail. "Ground-based observations with a wide-angle field of view can best watch the tail develop. In addition, we will get to look at wavelength regions we won't have on the spacecraft and can look for molecules coming outside from the nucleus, different types of molecules. We're hoping to see a change in the chemistry after the impact as compared to pre impact. "So there will be a lot of exciting science...at various observatories all over the world," she said. "Basically, everybody's going to be able to participate." The impact will have no detectable influence on the comet's orbit around the sun, scientists say. "The comet is so large and the spacecraft is so small that it's sort of like an 18-wheeler running over a gnat," Yeomans said. The mission follows NASA's Stardust project that flew past Comet Wild 2 last January, catching dust particles for return to Earth in 2006. The European Rosetta mission is currently flying to Comet Churyumov-Gerasimenko where a tiny lander will be dispatched to the frigid nucleus. If the Deep Impact mothership remains in good health, NASA could route the craft to other comets for close-up imaging by the onboard cameras, A'Hearn said. Justin Ray is editor of Spaceflight Now. He is based at Cape Canaveral and has covered the space program since 1995, including 75 Delta rocket launches.